This week we introduce a new series dedicated to Satoshi’s own Bitcoin Forum. In the first article of a three part series, we review some of the history of the forum, review its importance to the development of bitcoin, present to you some of its most iconic threads, and give you an overview of its contents. We also review some of its more eccentric features that are not usually found in other topical internet forums, and explain how the forum has become the thriving, multi-million member ecosystem that it is today. Aside from bringing us bitcoin and the blockchain, one of Satoshi Nakamoto’s longest-lasting innovations was the world’s oldest bitcoin-oriented internet forum, bitcointalk.org. Launched on November 23rd, 2009 and using the ubiquitous Simple Machines Forum (SMF) format, the Bitcoin Forum (sometimes referred to as Bitcointalk, or BTTalk) started as a gathering place for a hub of developers, bitcoin enthusiasts, and anybody else taken by the idea of cryptography-based, peer-to-peer software for digital currencies. Previously, the forum was hosted on Sourceforge, however it is no longer accessible, which is why Satoshi refers to Bitcointalk as “the new Bitcoin forum” in his inaugural post. Although Satoshi’s time at the forum was relatively brief in the scope of things – composing a total of 575 posts across a time span of 13 months before disappearing from the public eye completely – he got the ball rolling for the development of the bitcoin community, attracting some extremely bright minds that would help nurture bitcoin from a highly experimental idea to a robust, multi-billion dollar industry. Not only does the Bitcoin Forum serve as a hub for like-minded intellects dedicated to working on the improvement of bitcoin, it is also a community, an ecosystem, and a repository for a wealth of cryptocurrency information. Much like the blockchain, it is a living, breathing record of information that is largely unaltered, interactive, and open to the general public for participation and examination. It is simultaneously the home of long-standing members of the bitcoin community as well an entryway for those looking to get involved. Perhaps most importantly, it is the story of how bitcoin, the blockchain and pretty much all of cryptocurrency came to be. From a historical standpoint, it contains not only the best introspection into who Satoshi was/is as a person, but also stories from several other prominent names in bitcoin: Gavin Andresen, Hal Finney, Mark Karpeles, and Roger Ver, to name but a few. It was also the launchpad for pretty much every single cryptocurrency of note – and still is – with top coins like Litecoin (LTC), Dogecoin (DOGE), Dash (DASH), NEM (XEM) and Ethereum (ETH) all launching and cultivating an initial following through the Bitcoin Forum. All of these coins (and hundreds of others) maintain active “threads” on the forum, some of which are now thousands of pages in length, with hundreds of thousands of comments, and millions of views. the first ever ICO (Mastercoin, a protocol that runs on top of the Bitcoin Network). a message from the DAO hacker, an event that went on to usher the hard forking of Ethereum into ETH and ETC, with one chain resetting the blockchain to exclude transactions involving the hacked coins and the other with the transactions intact. the decision to implement a new system of “merit” designed to prevent spam and scam accounts from reaching high forum rankings. Activity is distributed strictly based on time active on the forum, determined by the number of posts a user creates across a 2 week time frame (up to a certain amount), and merit is distributed by members to posts they find interesting, educational or somehow valuable to the forum. Each time a user receives a merit, they are awarded 0.5 sMerits, which are “sendable merits.” This insures that members cannot simply trade merit back-and-forth to each other in order to increase their rank. The number of available sMerit would therefore decay across time, if it were not for “merit sources,” which tend to be senior ranking members of the forum, who are given a varying allotment of sMerit each month which they are then entrusted with distributing to posts of value to the forum. VIP. Very Important Person. This label is reserved for people who have donated 50 or more BTC to the forum. Some of the most well-known of these include Roger Ver (MemoryDealers), Mark Karpeles (MagicalTux), and Hal Finney (Hal). Donator. These are members who have donated 10 BTC to the forum. Copper Member. A Copper Membership can be purchased for a nominal fee, paid using BTC or GRIN. Besides having a distinguishing label under your user name (that reads “Copper Member”), certain perks of membership include not requiring any merits in order to wear a signature and being able to wear an avatar at the Member level (as opposed to Full Member). This makes the Copper Membership particularly attractive to signature campaigners or bounty hunters, but it’s also a good way to show one’s dedication to the forum. It is the first and last of these offenses that are the most common reasons for a user to be banned. After the introduction of signature campaigns (which go all the way back to 2011), the forum begin to see an influx of members whose sole purpose of joining the forum was to make a profit as a signature campaigner. As cryptocurrencies blossomed well beyond bitcoin, signature campaigns were extended into bounty campaigns, where members were awarded in the form of altcoins or tokens for completing certain tasks related to an ICO process. Traditionally, the term “bounty hunter” (as used in crypto) specifically applied to members who translated project whitepapers, created graphics, tested software, or otherwise performed work on behalf of an ICO, but this definition has been extended to include signature campaigners as well. After the launch of Ethereum and the beginning of 2017’s great bull market, members signed up to the forum in hoards, hoping to make easy money by simply joining a campaign. This created a problem for long-time users of the forum who complained that the quality of forum posts was being diminished and that unhelpful spam was on the rise, some of it completely off-topic, unintelligible, or completely plagiarized from another source. The forum was shifting away from its goal of helping enthusiasts find information about particular aspects of cryptocurrency and giving them a place for discussion and quickly becoming a cesspool of spam. In September 2018, theymos decided to combat the spam problem by implementing a new system where new members would have to obtain at least 1 merit in order to rank up and become a Jr. Member. As a point of reference, most ICOs do not include Newbie members in their bounty campaigns, preferring to focus on rewarding more experienced forum participants. In order to reach the next rank, a user must obtain a set number of merit points from other users, which now applies to Newbies wanting to rank up to Jr. Member. Before this time, a member’s rank was determined solely by their post count and active time on the forum (activity), which meant that anybody could create any number of accounts and gradually rank them all up to Legendary by simply posting on the forum daily with them. Other users, however, were apparently horrified at what had just occurred, perhaps seeing the prospects of their dream jobs go up in flames. Regardless of anyone’s opinions on the matter, the changes will stay, making the “easy money” appeal of cryptocurrency just a little bit less significant than it was before and serving to deter manipulation of the system via mindless spam posting. The most recent change to the forum has to do with an aspect not yet talked about, the Trust system. In the forum’s early days, before the Trust system was implemented and made viewable in most sections, a select group of members had the ability to label known cheaters and thieves with a “scammer tag.” This would appear under the user’s name next to every post they made to let other users know they should probably be avoided for the purposes of making trades and were generally untrustworthy. The forum also employed a “karma” point system. Karma is an optional component of SMF forum layouts that shows the popularity of a certain member. When members are allowed, they can “Applaud” or “Smite” a member to raise or lower that member’s karma score. In May 2013, theymos introduced “Marketplace trust,” which slowly evolved to become the Trust system. Along with karma, the scammer tag system was phased out later that year, all old tags being replaced with a -2 trust rating in their score. The whole idea was to let members engaged in various trading activities leave positive and negative feedback for other members they had previously traded with, kind of like an eBay scoring system, in order to give potential future traders some idea of whether or not a member was trustworthy and would fulfill their end of the bargain. Neutral escrow agents are frequently used in order to make sure a trade goes through properly, usually taking a small percentage of the overall amount transacted as a fee for their services. But in situations where they cannot be easily used (such as in an ICO), the Trust system helps give the average member an idea of how trustworthy a particular trader is considered. While anybody can leave a positive or negative trust rating and comment for a member, only certain members have direct bearing on the score that appears to most forum visitors. These are known as Default Trust (DT) members. Members of DT1 were previously only handpicked by theymos, and members of DT2 were picked by those in DT1. Members can also create their own Trust lists by adding members they find to be trustworthy and excluding those they deem to be untrustworthy. In January 2019, the Trust system was again changed to make DT1 more “decentralized.” Instead of the list of DT1 members being handpicked by theymos, criteria was developed so that any member could theoretically become a DT1 member, so long as they met those criteria. Similar to what unfolded during the introduction of the new merit requirements for ranking up, quite a stir was raised in the community as the ratings of several member changed from red to green (and vice versa) overnight. A few members fell off the DT1 list, and many more were added. As a result, the list of members on DT2 changed significantly as well. Though things may seem unstable at the moment as far as the Trust system is concerned (as of February 2019 the Meta section of the forum is still witnessing an upheaval of controversy), it is a largely benevolent attempt to allow the forum to have a bit more self-governance, so that everybody does not have to rely upon one single person to decide who should be in the DT1 list. So, why is all this of great importance in the world of the Bitcoin Forum? 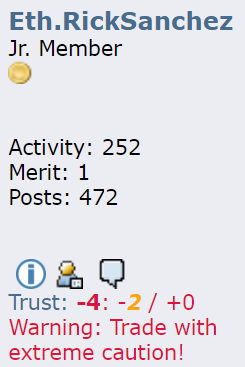 A member’s reputation in the forum is dependent on a number of things: rank, seniority, merit count, and also trust score. Any or all of these factors can come into play when a member applies for a signature campaign. Outside of low rank, the most common exclusionary factor as far as signature (or bounty) campaigns is concerned is a negative trust rating. If a member is deemed untrustworthy, the impact they have on promoting the service advertised in their signature space might be diminished. Likewise, if a member has a green trust under their name, they might be all the more effective in promoting the service in their signature space. Ergo, members with negative trust scores frequently have a hard time being accepted into a campaign, while the opposite is true for members with positive trust scores. This concludes the end of the first article in a three part series on the Bitcoin Forum. Next week, we bring you some insight from long-standing members of the forum and review some of its most famous personalities on an individual basis. Have any questions about how the Bitcoin Forum works? Feel free to leave us a comment!